Nestled in an active little community of Scottsdale, Arizona, CRAVE GROUNDS breaks uncharted territory in THE MERCADO Shopping Plaza, offering Arizona’s BEST locally brewed coffee and CUSTOM mini-donuts made to order HOT, FRESH and LOCAL! An exciting experience for ALL who visit. The Mercado is located on the corner of Mountain View and Via Linda on the South-side of Shea Blvd. 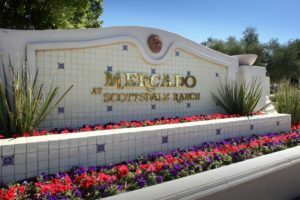 The Mercado has been a community standard for the folks of Scottsdale Ranch for over 30 years. Crave Grounds caters to the sweet-tooth in all of us with Custom Mini Donuts. Donuts are prepared and cooked right on the spot. Then, you choose from a variety of frostings and toppings to have your donut your way, right then and there. Favorites include the Lemon-Raspberry, Cinnamon Roll, S’mores and good old fashioned plain. And to complement? How about a full espresso bar or some fresh brewed coffee or tea? Whatever you’re “craving”, we’re sure that we can make it.